The single crochet join is an easy and effective way to crochet squares or other pieces together. It's bulkier than many of the other joining methods; that can be either an advantage or a disadvantage, depending on your objectives. You might not want to use it on sleek fitted garments, but it makes a wonderful finish on certain types of afghans. 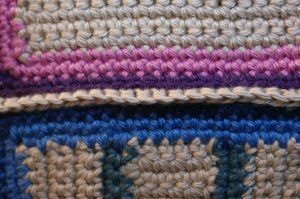 Unlike the slip stitch join, the single crochet join is symmetrical; this means that you could use it on the right side of the work if you want to. When used to join multiple granny squares to create an afghan, the look reminds me of a grid. This effect is, in my opinion, the technique's major advantage. I think this join is particularly nice for use on otherwise plain and simple squares; it could add quite a bit of visual interest to a design. I once used it on a granny square afghan where the squares and the edging were all one color (beige.) Without the extra visual interest added by this join, I think the afghan would have been dreadfully boring. The afghan was a gift to a male family member; if you're gifting an afghan to a guy, I think this type of join is a nice touch -- assuming your design otherwise works well with it. (If in doubt, test join four squares first and see if it looks like it will work.) While the look isn't specifically masculine, it also isn't too froo-froo, so it's definitely guy-friendly. One thing I should mention: all of the above is my opinion, but there are two schools of thought when it comes to the single crochet join. Some crocheters think that it should only be used on the wrong side of the work. This puzzles me; If I did not want the texture visible on the front of the work, I'd personally use one of the flatter methods of joining. But, to each her (or his) own. Feel free to use it on the front or the back, whichever way works for you. Decide Which Yarn (Or Thread) to Use for Crocheting the Join. I recommend using the same type of yarn you used for crocheting the pieces you'll be joining; in my opinion, this works best if you use the same type of fiber in the same general weight. You can, however, use a different color (or colors) if you like; in some cases, you may wish to use a contrasting color, and in others you might want to use a closely-matching color. In this tutorial, I chose a yarn that is both; my yarn contrasts with the outer rounds of my squares, which are dark, but it is a color that was used in the squares. In the photo at left, you can see how my finished join looks. If you'd like to take a closer look at the picture, or any of the pictures in this tutorial, you can click on it to see it enlarged. Begin by Making a Slip Knot. Begin by Making a Slip Knot. Photo © Michael Solovay. Keep the slip knot on your crochet hook for the next several steps. Insert Crochet Hook Into Your Stitches. Insert Crochet Hook Into Your Stitches. Photo © Michael Solovay. Decide whether you want to work on the right side or wrong side of the work, and then decide which loops you want to work through. If you want the join to be on the right side of the work, like mine is, then hold your squares (or pieces) with the wrong sides together. You could work through the inner loops, meaning the back loop of the square closest to you and the front loop of the square furthest from you. This is the method I demonstrate in this tutorial. You could work through the outer loops, meaning the front loop of the square closest to you and the back loop of the square furthest from you. You could work through all four loops, meaning the front loops and back loops on both squares. This creates an exceptionally bulky join. Yarn Over Hook. Yarn Over Hook. Photo © Michael Solovay. Whichever loops you decide to work through, insert your crochet hook into them and wrap your yarn around the hook as pictured at left. Pull up a loop. Pull up a loop. Photo © Michael Solovay. Pull up a loop. You'll have two loops on your hook if you count the slip knot you made in the beginning. ...and pull it through both loops on your hook to complete the single crochet stitch. Single Crochet Join -- Work in Progress. Single Crochet Join -- Work in Progress. Photo © Michael Solovay. Here's how the work looks when the single crochet stitch has been completed. Single Crochet Join -- Work in Progress. Single Crochet Join -- Work in Progress. Photo © Amy Solovay. From here on out, the joining process is pretty straightforward; you're basically working a row of single crochet stitch. The only difference is that you'll work each stitch through both squares (or through both pieces if you're joining hexagons or other shapes.) Be consistent; for example, if you began by working through the inner loops, continue working through the inner loops all the way across the row. Here's how it looks when two squares have been joined. Notice that I haven't woven in my ends yet; I'm going to be adding other squares onto this piece. The ends will need to be woven in later. If you like the squares I used to demonstrate the single crochet join in this tutorial, be sure to grab the free pattern for this design: the scrap afghan square. You might also enjoy our free granny square patterns.